Our Junior League program is designed to introduce the game of pocket billiards (pool) to the next generation of pool players in a safe, friendly, family orientated environment. Each junior player will receive instruction on the basic fundamentals of how to play pool, will learn to play the games of 8 ball and 9 ball in both a singles and doubles format as well as learn to work as a team. Each junior player will be encouraged to help one another and to enjoy the game of pool. 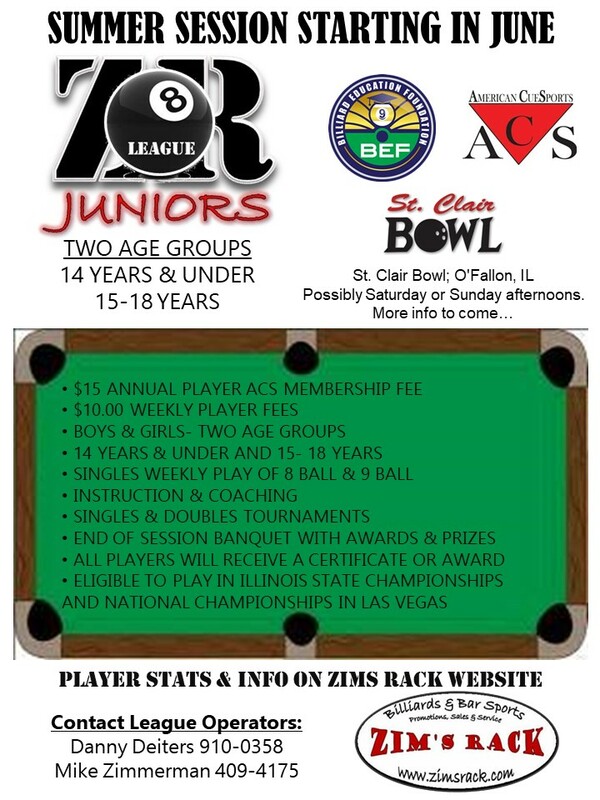 All members of the ZR8 Junior League will also be sanctioned by the American Cue Sports (ACS) and the Billiard Education Foundation (BEF) and be eligible to participate in the ILLINOIS ACS STATE JUNIOR CHAMPIONSHIP as well as the BEF JUNIOR NATIONALS at the Billiard Congress of America (BCA) Expo in 2020. Each league session will last approximatly 10 weeks, guest appearances from past Junior players, professional pool players, coaches, referees and commentators and end with a banquet with a pot luck style meal and awards as well as playing a few games of pool with their new friends. The Junior Program will be led by Michael Zimmerman from Zim's Rack and assisted by local experienced pool players. Michael is an OFallon resident and has been playing pool and running leagues and tournaments since 1994, in multiple countries while living Europe, Middle East and Asia as well as the United States. Michael is a Certified Instructor thru the Billiard Sanctuary Academy of the Cueing Arts (BSACA) and the American Cue Sports (ACS).